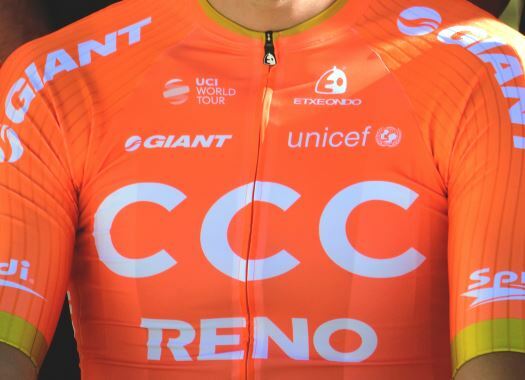 CCC Team's Patrick Bevin has kept the leader's jersey of the Santos Tour Down Under after the third stage. The New Zealander took the GC lead after the second stage of the race. Bevin finished in fifth position of the third stage of the Australian race, as former World Champion Peter Sagan sprinted to victory. CCC Team managed to control the pace of the peloton during the entire stage and the rider maintained the calm at the end and crossed the line in the fifth position. "Today was the nervous stage," the rider commented. "To get through that still in the lead is a big step forward to the ochre jersey on Sunday. From here on out, I feel like it's about the legs. Today was the tactical day that could have really blown up. We managed it really well and I said at the start of the day that if we're coming into the sprint then we've done our job. To give back a little bit of time is not the end of the world. "The last lap was always going to be hard no matter how the day was ridden. There was too much at stake at the finish. I felt like I had to cover those last two or three kilometres to make sure it was all together at the finish and protect the jersey. I feel like I'm climbing really well and I had it completely under control in that last lap." On the fourth stage of the race, the riders will face the Corkscrew climb and a fast descent toward the finish in Campbelltown. "There is no hiding tomorrow," Bevin explained. "That [Corkscrew] is a very tough climb. Thankfully the stage should play out fairly simply tomorrow, everyone wants to see who has the legs on Corkscrew and let's hope it comes together at the bottom and we can stand here tomorrow still in the leader's jersey. "I feel like gravity is well in my favour for that eight-kilometre descent. I have done that descent a hundred times so I back myself to pull back any gaps. Obviously, they have to take time from me so it's a little bit like today, I may cost myself the stage but if it means I'm still in the jersey, then that's another win. I'll be fighting all the way to the line to keep the ochre jersey."